The Tokyo 2020 Additional Event Programme Panel, chaired by Fujio Mitarai, met in Tokyo on September 15 to decide on the final selection process, according to major Japanese media. At the press conference after the meeting on September 15, Toshiro Kono, Deputy Chairman and Secretary General of the Panel revealed that four events, Baseball/Softball, Karate, Sports Climbing and Roller Sports out of the eight shortlisted events have received high evaluation. Each of the seven Panel members will award marks ranging from 3-5 for the candidate events on 5 to 9 items such as popularity, appeal to the youth and penetration of the event in Japan. 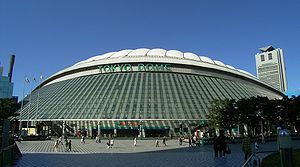 Given the limit of total additional number of athletes by IOC at 500, Secretary General Kono disclosed expression of some concern at the Panel meeting on the size of 300+ Baseball/Softball and absence of the top MLB players albeit high popularity and ticket sales of the event. The Panel will decide their final recommendation at the next meeting on September 28 for approval by the Board of the Tokyo Organizers on the same day. Baseball/Softball	National sports. Helps Excitement. Is participation by top players of MLB guaranteed? Bowling	Readily accessible sport. Levels of top athletes and amateurs differ little. Not played in Africa. Karate	Originated in Japan. Globally popular. Helps excitement. Difficult to understand point rating of KATA match. Roller Sports	Popular among the youth. Attractive as urban-type sport. Some disciplines have low profile. Sports Climbing	Popular among the youth. A unique sport of vertical climbing. Low profile in Japan. Surfing	Widely rooted as youth culture. Vulnerable to weather in the ocean. Wushu	High profile. Difficult to understand point rating. Ununiform distribution.